As ecommerce continues to grow and adapt to market demands, industries such as online grocery shopping grow with them. And as one of the major drivers of that change, Amazon is looking at rolling out its AmazonFresh program not only within the United States, but in Europe and even Southeast Asia. But what does the future of online grocery delivery look like now? Just as digital retailing giant Amazon wants to redefine delivery through the use of drones, now it sets its eyes on the burgeoning online grocery delivery market. While its initial efforts have been seen since mid-2007 surrounding Seattle, versions of AmazonFresh have spread to Los Angeles, San Francisco, San Diego, New York City, Philadelphia, Baltimore, Sacramento, parts of London, Boston, and now (just in October), Dallas and Chicago. But Amazon’s fresh grocery delivery program isn’t bound to stop there. In fact, they plan on opening around 2,000 AmazonFresh stores across the United States and sprinkling a few across the globe. While Amazon Prime Fresh (a predecessor program) had people paying $299 a year for the service, AmazonFresh’s business model shifted in October at a more affordable $14.99 a month as an add-on to Prime membership. Granted, this still averages about $180 for a year’s worth of subscription fees, but it’s a much more flexible model allowing members to opt in or out on a monthly basis, rather than an all-in annual charge. Comparatively, subscribers in the United Kingdom are charged £6.99 a month on top of Prime (which equates to about $8.79 USD at the time of writing); both American and British customers only pay delivery fees for orders under $40 and £40 respectively. AmazonFresh isn’t just a grocery delivery service; it’s one way Amazon seeks to emerge into the brick-and-mortar realm with physical storefronts and local distribution centers. When AmazonFresh customers order online, they can choose home delivery or to pick up their orders at their nearest location on their way home from work, foregoing any delivery fees on smaller orders. Users can log onto AmazonFresh’s site and put in their ZIP code to find availability of goods and locations nearest them — which seems to vary across cities that already offer the service. But how exactly is this concept going to work? Aside from Prime Fresh (the delivery service), AmazonFresh is looking to set up around 20 different test locations in cities such as Seattle, Las Vegas, Miami, and New York to figure out which of the two concepts works best. Though whether or not making the stores exclusive only to members might isolate more of the market than encompass it — unless, of course, it can find ways to be more competitive with other brick-and-mortar food providers who’ve already established themselves over the past few decades. Amazon also hopes to spread into the Southeast Asian market, making Singapore their beachhead in the region. According to Mashable, Amazon has been “covertly acquiring assets” such as new personnel and refrigerated trucks. Despite its openness on the rest of its AmazonFresh program, Amazon has been rather quiet about its expansion into Southeast Asia, though not without reason. China’s Alibaba is Amazon’s main global competitor has also been making moves to solidify its own claim in the region, most recently acquiring Lazada, a regional e-commerce company. Alibaba isn’t the only competition that Amazon is up against as it rolls out its online/brick-and-mortar grocery store hybrids. With each new store it opens in new metropolitan areas, Amazon has a slew of local grocery delivery services to tackle for a share of the marketplace. In Chicago, companies like Skokie-based Peapod and San Francisco-based Instacart have been serving local customers for years, mastering online groceries while Amazon just gets its feet wet. But even they have been struggling to remain profitable all this time. In northern Texas, however, Amazon must face a number of larger adversaries such as Kroger, Wal-Mart, and CVS Pharmacy, among others. These companies have been offering “specially designated areas of their parking lots” for order pick-up. Moreover, websites such as Blue Apron, Green Chef, and others (depending on region) offer meal plans and ingredients for weekly delivery. “The grocery industry is one of just a handful of retail segments that Amazon hasn’t been able to dominate in the recent years,” the Star Telegram notes. 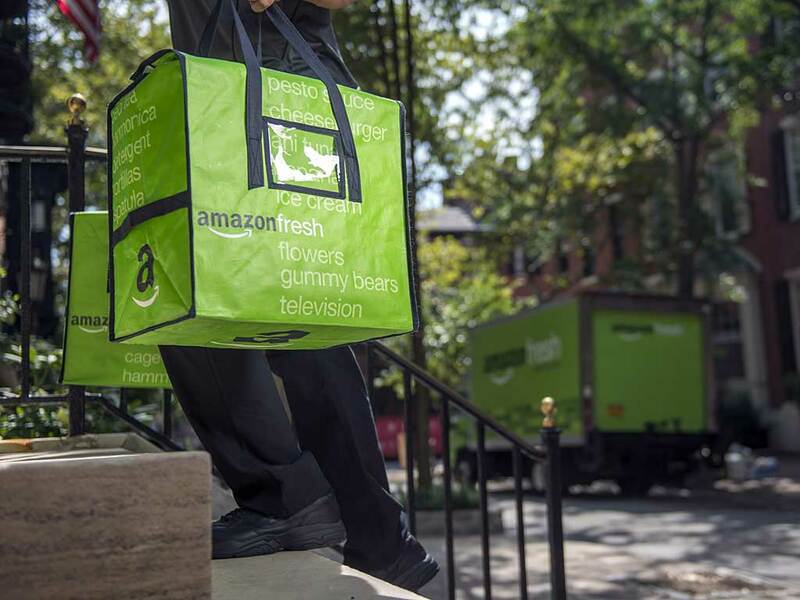 To answer its competition, AmazonFresh might take the form of convenience stores to better compete with curbside pick-up. With that in mind, Tristano and other food analysts are keen that AmazonFresh’s success will come from Amazon’s “capital and their brand.” Whether or not that’ll be enough remains to be seen. Online grocery shopping has been a growing trend worldwide, currently estimated at about $48 billion. Where some countries like South Korea have a 16.6 percent chunk of the global market, the United States barely makes it into the Top 10 countries with 1.4 percent. Even within the U.S., online grocery sales account for less than 5 percent of overall grocery sales, though it’s expected to grow to about 10 percent annually — or finding a valuation of about $9.4 billion by 2017. Phil Lempert, another American food analyst, suggests that AmazonFresh hasn’t accounted for another surging trend in grocery shopping: the rise of convenience stores fresh food options and quality. “You can almost smell the fear of some retailers,” he notes in his critique he wrote for Forbes. “I’m not sure that if Amazon does follow [its] plan that it will be as disruptive and game changing as many predict. I see it as bit more iffy. I’m afraid that Amazon may well be looking at the past iterations of grocery shopping with a few technology whiz-bangs rather than looking to the future, as they try to fill in a niche between two already successful formats that are on the cutting edge.” Even as Millennial and Gen Z shoppers embrace technology and online ordering, they also seek “unique and different” experiences which AmazonFresh might not be able to deliver. In-store dining has also been spreading to grocery stores as seen with Bellingham, Washington-based Haggen, Whole Foods, and Wegmans, to name a few. Technomic even reports that in-store dining is outpacing traditional restaurant growth and an increase in consumer trust in convenience store food offerings. From their 2016 report, 56 percent of Technomic’s respondents feel that convenience stores are “just as capable as restaurants in offering fresh foods and beverages”; that number creeps up to 67 percent among Millennials surveyed. But convenience stores are just one of two threats to AmazonFresh Lempert mentioned. The second? Small, bare-bones grocery chains. What’s going to hit AmazonFresh the hardest is competing for price. Whereas Aldi and Lidl have managed to offer foods anywhere between 40 – 50 percent lower than their competition, AmazonFresh, at present, has been more than or equally expensive to supermarkets it competes with locally. And with its pricing model up in the air (will AmazonFresh be available only to members or even worth the extra $15 a month? ), it’s truly hard to say how well Amazon’s grocery program will fare unless it takes all these factors into account. Where do you think online grocery shopping is headed in the United States? Do you think AmazonFresh is a wilted product before it even ships out? Only time will tell.